See more pictures of the book, Sidewalk Flowers. 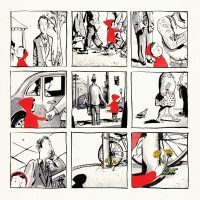 This week the inspiration came from a wordless book titled Sidewalk Flowers, an Illustrated Ode to Presence and the Everyday Art of Noticing in a Culture of Productivity and Distraction, by JonArno Lawson and Sydney Smith. So much can be told with simple pictures. This is what Maria Popova says about mindfulness. It is something we all need to hear. “How we spend our days, of course, is how we spend our lives,” Annie Dillard wrote in her magnificent defense of living with presence. But in our age of productivity, we spend our days running away from boredom, never mind its creative and spiritual benefits, and toward maximum efficiency. Under the tyranny of multitasking, the unitasking necessary for the art of noticing has been exiled from our daily lives. And yet, as we grow increasingly disillusioned with the notion of “work/life balance,” something in our modern souls is aching for the resuscitation of this dying capacity for presence. That capacity is especially essential in parenting, where the cultural trope of the device-distracted parent is an increasingly disquieting pandemic. Half a century after Ruth Krauss wrote, and Maurice Sendak illustrated, one of the loveliest lines in the history of children’s books — “Everybody should be quiet near a little stream and listen.” — poet JonArno Lawson and illustrator Sydney Smith team up on a magnificent modern manifesto for the everyday art of noticing in a culture that rips the soul asunder with the dual demands of distraction and efficiency. I hope all my readers will take a moment right now and reflect on just being mindful and present. Good thoughts to all of you.